Love to win? Or hate to lose? 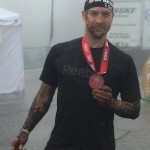 Pursuing more of my “Love to Win” side at the 2014 Spartan Sprint obstacle race. Call it ironic, but in my less-than-fit days I was a regular subscriber to Men’s Health magazine. I eventually decided to take a different route to improved fitness. While I can’t say I would credit Men’s Health for my success, there was one posting that left a long-lasting impression on me. This specific article effectively split humanity into two simple groups. Group 1: Those who love to win. Group 2: Those who hate to lose. Of course everyone prefers winning and, thus, would rather not lose. But most people, if they really think it through, can probably identify what fuels them more; the rush of victory or resentment toward loss. It didn’t take me long to realize I was a hate-to-lose kind of dude. If my team, in any sport, was winning life seemed in order and under control. There was balance in the Force. But if we were losing my emotions would take over in an effort to avoid failure. I would walk away from any loss feeling frustrated, unsettled and pondering what I could have done to avoid it. I didn’t need to celebrate the wins as much as I needed to avoid the feeling of loss. I embraced that discovery and used it to make me better. In hockey I became a defensive, shut-down centre, eventually turning to a pure defenseman where my emotional drive to avoid getting beat could feed my game. It proved to be a good move for my career (boy, do I use the word career lightly). So which one is better? I could give you all sorts of analogies of how either approach has a proven track record of success. But the key is to find out who you are and challenge yourself to bring the other element into your life a little more. I’ll use a hockey analogy (get used to it) to show you what I mean. It is commonly preached that “defense wins championships.” But it is also a fact that you can’t win the Stanley Cup without scoring goals. Even the defensemen need to contribute to the offense for a team to be a serious contender. More specifically, the great players who lead their teams to the big games are the ones who find the right balance of defense and offense. Those players aren’t born playing like that. They all enter the league with one style of play that has gotten them to where they are. Then they develop that balance over seasons of growth, experience and hard work. The most successful players develop their weaknesses to complement their strengths. This is a concept we should all adopt for the sake of growth, inspiration and diversity. Whether you are more of a hate-to-lose or a love-to-win type, heighten your awareness to that and consider the areas of your life where a lack of balance has possibly challenged your growth or development. Then make the effort to approach the opposite way of thinking from time to time. It worked for George Costanza! Kyle Berger is a freelance writer and producer of the Berger With Fries health, fitness and entertainment blog. Follow him on Twitter @kberger16. Previous Previous post: Celebrate Canada’s start in P.E.I.